Maryland is one of the largest poultry and chicken produce states with the Perdue company headquarters located in Salisbury, MD on the eastern shore of Maryland. And so it’s rightly so that chicken should be one of the widely served foods in Maryland. One of our favorite ways to serve fried chicken is (surprise) Old Bay Fried Chicken. Tasty, and easy to make, this is a classic Old Bay recipe. In a large zip lock bag place flour and Old Bay seasoning. Mix thoroughly. is the right temperature. Place chicken in hot oil skin side up. Repeat dipping and flouring remainder of chicken pieces. Sprinkle a little more Old Bay seasoning on chicken in skillet. Cook chicken for approximately 20-25 minutes before turning chicken over. Periodically check chicken by carefully lifting a corning of chicken and making sure it is not getting too brown. If the outside is browning to fast lower the heat a little. Turn chicken over and cook for another 10-15 minutes. Again check to make sure chicken is not browning to fast. Remove from oil and place on plate lined with paper towel. 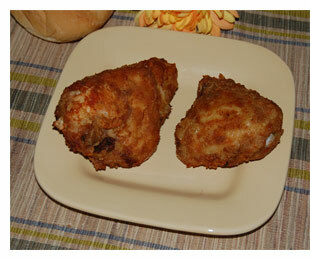 Serve Old Bay Fried Chicken hot or cold as both ways taste great.